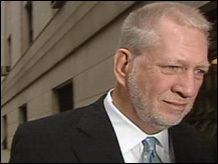 Former WorldCom chief, 63 years-old, could spend the rest of his life in prison. Ebbers, on his way to be sentenced Wednesday morning, pushed a photographer out of his way. Is former Worldcom CEO Bernie Ebbers' 25 year prison sentence appropriate? NEW YORK (CNN/Money) - Ex-WorldCom chief executive Bernard Ebbers was sentenced Wednesday to 25 years in prison for his role in orchestrating the biggest corporate fraud in the nation's history. Legal experts said the sentence, effectively a life term for the 63-year-old, appears to be the longest ever for a CEO found guilty of committing corporate crimes while running a Fortune 500 company. Ebbers was convicted in March for his part in the $11 billion accounting fraud at WorldCom that was the biggest in a wave of corporate scandals at Enron, Adelphia and other companies. WorldCom, now known as MCI, filed the largest bankruptcy in U.S. history in 2002. The company's collapse led to billions of dollars in losses for shareholders and employees. Ebbers was convicted in March of nine felonies that carried a maximum prison term of 85 years. On an overcast mid-summer day, Ebbers sat motionless grasping a tissue and wiping away tears as his sentence was read. After the hearing ended, Ebbers and his wife Kristie, both in tears, hugged in the courtroom, according to a CNN correspondent who was there. Earlier in the day, a grim-looking Ebbers had scuffled briefly with a photographer as he entered the courthouse. On a flight from Memphis to New York on Monday, Ebbers told CNN that he thinks his situation is "completely bizarre." Ebbers, who plans to appeal his conviction, had asked for leniency. His lawyers said Ebbers' failing health, history of community service and personal financial losses from WorldCom's collapse warranted a lighter sentence. Henry Bruen, a former WorldCom employee, disagreed. At Wednesday's hearing, Bruen told U.S. District Court Judge Barbara Jones about how he rose through the ranks of WorldCom's sales division only to be laid off in 2003 without notice. Bruen said he lost money, his medical benefits and is still unemployed. "I was one of the hard-working employees at a great company that was destroyed by Bernard Ebbers," said Bruen. After Ebbers was sentenced Wednesday, his lawyer told reporters that Ebbers too has paid a steep price. "He has a very serious heart condition and this trial was not helpful," said Reid Weingarten, a partner at Steptoe & Johnson in Washington, D.C.
Late last month Ebbers agreed to forfeit the bulk of his assets -- including a Mississippi mansion and other holdings estimated to be worth as much as $45 million -- to burned WorldCom investors and MCI. His wife will keep a modest home in Jackson, Miss. and about $50,000. Judge Jones ordered Ebbers to begin serving his sentence by Oct. 12. It's not yet known where he will be incarcerated, but the Bureau of Prisons has a policy of placing inmates within 500 miles of their homes, if possible. Ebbers is from Mississippi and Judge Jones, in issuing the sentence, recommended a low-security prison in Yazoo City, Miss., which is about 35 miles from Jackson. Legal experts were not surprised by the stiff sentence. They pointed to a series of harsh punishments that have come down in recent years, including the sentences last month for two former Adelphia Communications executives. Last month John Rigas, Adelphia's founder, and his son Timothy, the cable company's former CFO, got 15 years and 20 years, respectively, for their role in a multibillion-dollar fraud that led to the collapse of the nation's fifth-largest cable company. (Full story). Peter Henning, a white-collar crime expert who teaches at Wayne State University Law School, said prior to Ebbers' sentencing that the Rigas punishments put pressure on Judge Jones to determine a sentence that fell within a general range of 20 years. Judges, he said, like to be consistent. They also like to send clear messages, said New York defense lawyer Barry Felder. "When it comes to issues of fraud committed by chief executive officers, judges are very emphatic in trying to set a harsh tone," said Felder, who represented Theodore Sihpol, a former Bank of America broker who was found not guilty last month in a closely-watched criminal case over mutual fund trading practices. Felder is a partner in the law firm Brown Raysman Millstein Felder & Steiner. Unless the court of appeals overturns his conviction or revises his sentence, federal sentencing guidelines suggest that Ebbers could serve slightly more than 21 years if prison officials determine he's a model prisoner. In that event, said former prosecutor John Hemann, Ebbers would likely be released several months early to serve out the remainder of his sentence in home detention or a halfway house. For now, however, Ebbers' freedom is limited to the three-month window between Wednesday and the October start date for his prison term. Ebbers must now surrender his passport, if he hasn't already, said former prosecutor Brad Lewis. His travel within the United States may be restricted and it's possible that prison officials will take additional steps to ensure that he doesn't flee, said Lewis, a partner in Fenwick & West in Mountain View, Calif.
Next Ebbers will likely ask Judge Jones and then, if that fails, a higher court, to allow him to stay out of prison pending the outcome of his appeal, which could take a year or more. While criminal defendants usually are locked up during their appeals, exceptions are often made for white-collar criminal defendants, said Lewis. In the last year both Martha Stewart, the lifestyle expert, and Frank Quattrone, a former banker, were allowed to go free while they appealed their separate convictions on obstruction of justice charges. (Stewart chose to serve her time rather than wait for the appeals court to rule). Several legal experts said that Ebbers' punishment was reasonable. "The reality is that Ebbers was the CEO of one of the biggest companies in America. The jury found that he intentionally defrauded the thousands of shareholders that owned the company and that it resulted in the biggest bankruptcy in American history," said Hemann, a former member of the Justice Department's Enron Task Force who is now a partner in Morgan Lewis & Bockius in San Francisco. "It's hard to say that there are many more deserving cases for a long sentence than this one." A day before being sentenced, Ebbers called his predicament "bizarre." Click for more. For the latest on all the corporate scandals, click here.